So as your saw from my Vichy event post 'Here' I had an amazing time at the launch for the Normaderm range back in July. I have given the three products (that I was lucky enough to receive in my goodie bag) a good trial run for about a month and half, and I thought I would talk you through what I think of each product, and whether I'd recommend them. First up is the Normaderm 3 in 1 cleanser, scrub and mask. I was asked at the event which cleanser I would prefer to take home, and I opted for this multi-tasker as I adore products that offer more than one function. Cleansing cream: eliminates sebum and impurities. Mask: mattifies skin and clarifies complexion. Cleansed and soothed, your skin looks clearer, and feels more fresh and comfortable. Rich in soothing agents and Clay, the Tri-Activ Cleanser is kind, even to sensitive skin. The creamy texture makes it easy and pleasant to apply, either as a cleanser and scrub or as a mask. Rinse off with plenty of water. Leave to dry for 5 minutes. I adore this product, I use it every morning. And if I have the time whilst brushing my teeth - I let the cleanser sit on my skin for longer so that it creates a mattifying mask. I have only found one negative about this product - which is when you wash it off - I use a hot wet cloth to remove it and sometimes I find small exfoliating particles left on my skin. No biggy - but this can be irritating when your in a rush in the morning. Other than that I found the product cleared the small spots that I have on my nose, did not dry my skin out, and was a pleasure to use. 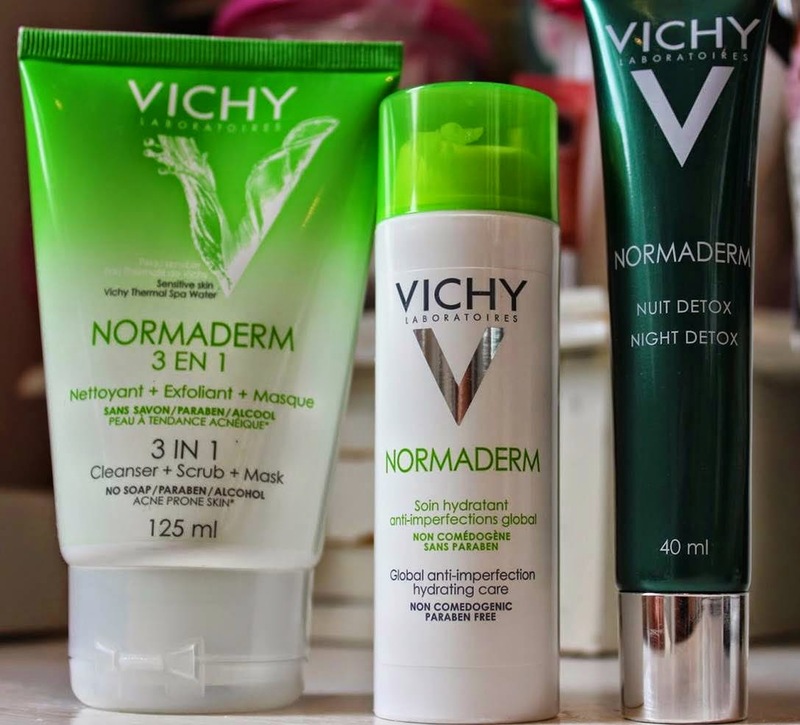 Next in the trio is the Vichy Normaderm Hydrating Care. Now I have been using this as a morning face moisturiser - probably not what it was meant for, but ideal all the same! -Blemishes-Pores-Shine-Oily Skin-Marks-Uneven Complexion Inspired by dermatological peeling, the new formula is enriched with LHA + Salicylic Acid + Glycolic Acid to help reduce the appearance of imperfections, revealing a complexion that looks healthier and more even.Hypoallergenic. Non-comedogenic. Paraben-free. With soothing and fortifying Vichy Thermal Spa Water.So effective, skin looks purer and healthier. Apply daily to clean and dry skin. Avoid the eye area. For best results, use after Normaderm Deep Cleansing Purifying Gel and Normaderm Purifying Pore Tightening Lotion." This lotion is thick but light - weight with a refreshing scent. It moisturises my skin well, and it provides me with a good base on which to apply my foundation. Although this is only a 50ml size, a little of this product goes a long way. At night if I want to layer up my skincare, I will use a serum and then pop this over the top to really boost my skin. "Upon awakening blemishes appear reduced, pores look less visible, complexion is radiant and skin feels clean and purified. Those with oily, blemish prone skin suffer from an over production of sebum during the night. By morning, the skin can feel dirty and dull with additional blemishes. New Normaderm Night Detox targets the skin overnight by helping to control the production of sebum while purifying the skin. Powerful formula yet kind to the skin. The texture is light and non greasy leaving the skin with a clean fresh sensation. Use with Normaderm Hydrating Care to target blemishes day and night. Apply nightly to clean, dry skin. Avoid the eye contour area." This product has a glorious light texture, and I use it at night on its own, or with a serum underneath. It doesn't dry my skin out, has a freshening fragrance and leaves my skin with a moisturised feeling. I have noticed my pore size (especially around my nose and cheeks) reducing since using this product. My skin does feel fresh and clean after using the complete Normaderm 3 step routine, and I am really impressed with this results. You can pick up the Night Detox for £15.50 'Here' I love this product so much I have already used half of the tube! So have you tried any of the Normaderm range? Or Vichy for that matter? I have a BB foundation to trial next so I shall keep you posted on that. If it's anything like the Normaderm range it'll be worth every! Thanks to the team at Dowal Walker for the invite to this event I had a great time. Vichy does great products! I'd be curious to try the Pro-Even serum!